C3D Labs, a resident of Skolkovo’s IT cluster, has launched the latest module of its C3D Toolkit for visualizing 3D geometry, designed for developers of engineering software. 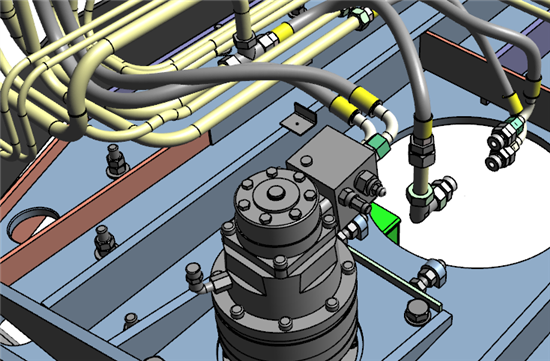 An image of a 3D model using C3D Vision 2016. Photo: C3D Labs. C3D Labs, a subsidiary of Russian computer-aided design (CAD) solutions developer ASCON Group, says its product differs from other visualizers on the market in that the latter are generally designed for the animation and video gaming industries, while C3D Vision was created with the requirements of the computer-aided design industry in mind. "As the ASCON Group worked on developing our 3D MCAD software KOMPAS-3D, we came to understand very clearly what the perfect visualizer should be like for CAD developers,” said Dr. Eduard Maksimenko, head of C3D Vision development. “We implemented this understanding in C3D Vision, and so received positive feedback from companies that took part in our beta tests. I am confident that all our customers will appreciate how well our new C3D Vision module integrates into their software," he added. C3D Vision’s capabilities include hiding edges when rotating 3D models, pixel culling and mirroring. C3D Labs carried out the beta testing of its new visualization component with the help of Center GeoS, which was already a C3D Solver customer and which gave the company feedback on its product, having used the parametric kernel in its K3-Furniture software for designing and selling cabinet furniture. "We welcomed the news of a novel visualization module from C3D Labs, and so beta-tested it,” said Dr. Sergey Mitin, deputy director of GeoS. “We will use it in our software once we unify our internal development tools. We believe C3D Vision solves the compatibility problems we had been experiencing between software and state-of-the-art graphics cards. We look forward to increased capabilities of the new module in the future, as we find that C3D Labs always responds to customer wishes, and we will certainly provide some," he added. The new C3D Vision 2016 module can be tried out free-of-charge for a trial period of three months. The C3D Toolkit is used by developers of CAD systems around the world, as well as by educational institutions. C3D Labs has been a Skolkovo resident since 2013.